Finally, I did another pop-up card! Pop-ups really are not hard to make at all. What makes them so time consuming is that you need a design for the outside plus a design for the inside. It’s kind of like making two cards. Do you love this stamp set? So, so funny! I purchased some other really funny sentiments that I am going to use with it. Don’t forget Sunday is the last day to enter the March Challenge. On Monday, two random entries will be selected to win a $25 Simon Says Stamp gift certificate. Just FYI, before I run the program that will select the winners, I will remove any duplicate entries. So, if you entered two photos of the same card, I will remove one of those photos. Thank you to everyone who has participated so far! One more thing… if you could please enter your first name on your Profile Page, I would greatly appreciate it. I like to answer questions and comments personally, but many times I can’t because your name is not listed. Thank you in advance! I love a card with tons of steps and some fantastic techniques. Thank you another great video!! What a fun card! Really like the clear embossing powder and what it does for the depth of the card. The little heart to close it with is a great idea. The balloons make the card so much fun. Thanks for showing it!! That is about the most darling card I have ever seen! Love , love , love this idea. So, so, so cute!! But so overwhelming – LOL; I’m a dork! If you say any inch measurement beyond the ‘standard’ 1/4″, 1/2″, 3/4″, 1″ – I’M LOST! I’m such a goober!!! But I adore the card; the colors are fantastic!! I was going to try and help after watching the video if no one had responded yet but now I’m confused as to what you are confused about. LOL Can you be more specific what you are asking? Are you asking about the measurements for making the cuts for the pop-up or the measurements for all the cardstock that gets layered to make the card base? No worries! I know it came and went quickly. The measurements are 1/2″ each, so 3 marks: 1/2″, 1″, and 1 1/2″. Then, it’s 7/8″ out to make the popup. Let me know if I need to explain that better. Okay, off to watch the video! =) Oh and btw…my first name is Sandra. I put SandraMaria in my profile as my first name because there always seems to be more than one Sandra and because my last name could be a first name — it’s less confusing. Does that make sense? Not to confuse you further but Maria is not my middle name, either. My mom use to call me Sandra Maria, so it’s endearing to me. Hi Sandra! Nice to know about your name. 🙂 The other sentiments I picked up are from Riley & Co. I think I’m going to use one of them next week. Ah, I can’t wait to see! Darlene, this card is too cute, and I love the sentiment. I too am planning to purchase the stamp set. You always provide easy instructions. I appreciate how much effort and time you put into each card video, and the videos you provide regarding products. I look forward each week to see what you have done. Thanks so much for sharing with us. Oh. Em. Gee. Clever, clever girl. This is truly brilliant and, oh so, fun. Darlene – you outdid yourself this time. How fun! You must have had a good time designing this one. Love it! Oh this card is tres cute Darlene, you’re such an inspiration. I adore the stamp set so must add to my wish-list. Really fun to watch, and I’m sure you had a blast creating it. On the D/ L – glad to see the boo-boo too, makes me feel a whole lot better as the “repair” is something I have used on cards myself. So much time and energy in backgrounds to have to start over. Hi Darlene, I am getting an error message on the video saying the connection was reset so unable to watch your video. I would love to see how you created this fab pop up card. Hi Ev. Did you get to see the video? “The connection was reset” usually has something to do with your connection to the internet. Yes, I did thanks Darlene. It worked after I waited for a bit. Thanks for the pop-up tutorial. I enjoyed it enough, that I’ll try it soon. So much fun! Don’t know if I could follow it or not but I still loved it! Thanks! ha, ha – that sentiment is so funny. Cute card too – love the pop up balloons. Oh Darlene, I’m so darn late commenting on this fabulous card but my dear hubby is on vacation for 2 weeks so we’ve been going out a lot or just staying in and chill. We just came back from dinner and a movie but I didn’t want to wait till tomorrow to tell you that this is one of the most fantastic pop up cards I’ve seen in a while. One of the most amazing things about it is that you created it by just measuring and cutting, no dies, not to much fuzz. I love it and I happen to have a set of balloon dies that will be fantastic to CASE your card. I love this sweet lady in the front, this is indeed a really cute set. Thank you so much for the fabulous video and directions to make a card like yours. Thanks as always for your sweet comment Maria. I hope you had fun on your night out! You make it look so easy Darlene. Thanks for the great inspiration. Darlene, you make it look so easy. I just love your tutorials and get so much inspiration from you. This is a snazzy card! As usual you did such a good job. I think I will try it also. I just love pop ups! Keep up the good work!! Thanks!! It’s so gorgeous…love it and have to try it. Thanks so much for showing us! Awesome card (as always), Darlene! Thanks for making what could be a very intimidating technique look so straightforward! Also, thank-you for including your errors! As an educator, I know how important it is to show the kids that we’re not perfect, we all make mistakes and there’s always a way to “fix’ things! So, I truly appreciate that part, too! LOVE this card!! Can;t wait to use this technique. Thanks for all you put into this for all of us. I so enjoy seeing your video’s. Love it !! Another great card, thanks Darlene. Love this card and the pop up. I will have to try this. You have such great ideas. Thank you again. Also thanks for the information about Copic markers it will be very helpful when I am ready to order. Okay… I read all the comments to see if anyone else asked this question. I went back and watched again to see if I could figure it out, but I couldn’t. :/ Why do you use two pieces of cardstock and overlap them rather than just using one long piece? Great card, and I love your clever ideas! Excellent question Donna! Typically, I do use one piece. However, it can be difficult to get the scored areas of the outside and inside pieces aligned. Since the white piece is located inside the kraft piece, it will need to be slightly smaller so that you can close it without an issue. I decided to use two separate pieces so that each fold would be free to fold as one layer. Does that make sense? Yes! I sort of figured it out, and I decided to give it a shot before I got your reply. Unfortunately, I forgot to follow the directions as you gave them, and I had an issue with the closure! Go figure. I should’ve lined my panel up with the score/fold on the right but instead, lined it up to the left, exactly on top of the bottom piece, which threw it off just enough. I managed to make it work and am happy with the card! I did mine a little differently and used the Stampin’ Up! hostess set “Time To Celebrate.” That caterpillar was just too cute! What a fun card! Thanks for the video, sure makes it easier to make my own! Love this card! So adorable – another great job, Darlene! Darlene! This card is amazing! I love love love it! This is definetly a prime example why I subscribed to your card community instead of others. You have priced the monthly membership right. Your cards are brilliant! I appreciate a clean and simple card – but I really want more interactive cards! This may make take me an extra 30min to make, but I will love every minute of it and I know my friends and family will ooooo and ahhhhh over the final result too. Great use of shape dies and border dies! It has me thinking more creatively about the products I have. Gosh, I can’t say enough about how much I enjoyed this video. Keep it up! Many thanks! I’m so glad you enjoyed it so much Amanda! That makes me happy. 🙂 And thank you for your YouTube comment today – it was so sweet. I have another fun interactive card coming up next week – I think you’ll like it! Hi Darlene, this is soooo cute – I just love it! Thanks for all the wonderful ideas – your cards are all so amazing!!!! This popup is one I am definitely going to try. THANK YOU again so much for this pop-up treat! I love being a member. 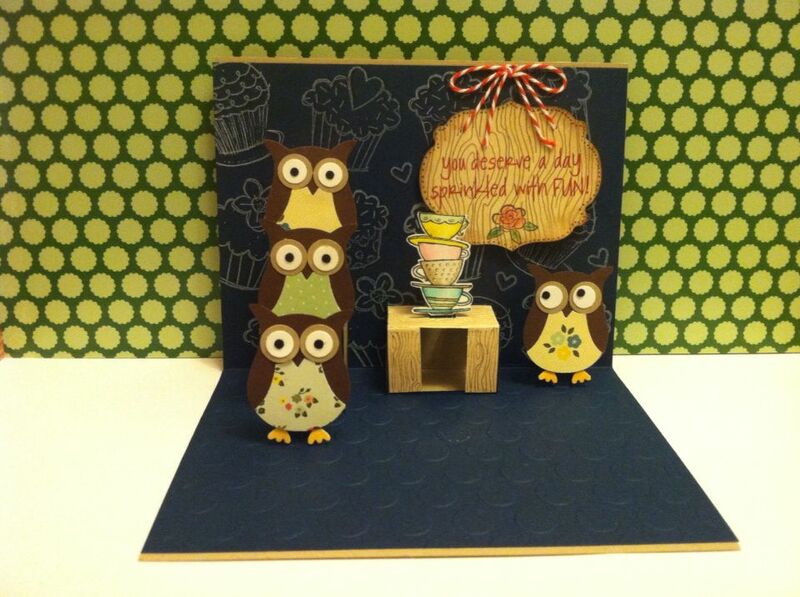 THE first card I ever watched you make was the owl on a tree branch birthday card. 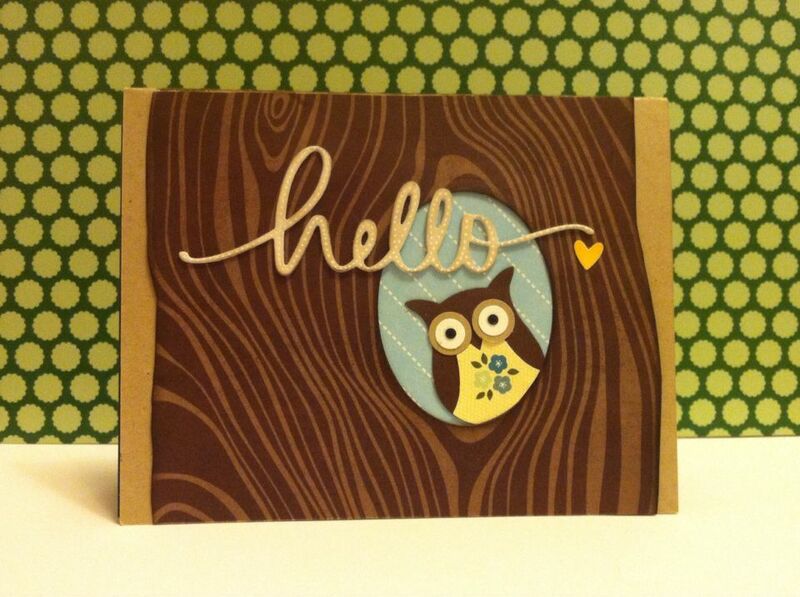 It insprired me to get out my Stampin’Up supplies and get into cardmaking again. It has grown into a bit of an obsession, expecially with my 18 year old daughter going away to college this year. I miss her everyday, but your inspiration helped me get through it, as I keep myself busy in my craft room. I wanted to share with you my latest card. I took out my owl punch, and created this card inspired by your owl pop-up. I hope you like it……https://s-media-cache-ak0.pinimg.com/originals/19/be/c1/19bec15aa895e76e114d04569b0ba6dc.jpg and https://s-media-cache-ak0.pinimg.com/originals/97/d8/13/97d813c9593f571f34e6a67cb4cf1336.jpg. Thank you for all your inspiration!! !